Arcade racing game. Become the driver of a huge monster truck. Pass through difficult levels and don\'t forget to watch out for time. Because the faster you finish the higher medal you get. Different obstacles like hills and barrels are waiting for you in that desert race. Pick up nitro bonuses to drive faster. Make some tricks to get additional nitro. Get gold medals to unlock a new truck. 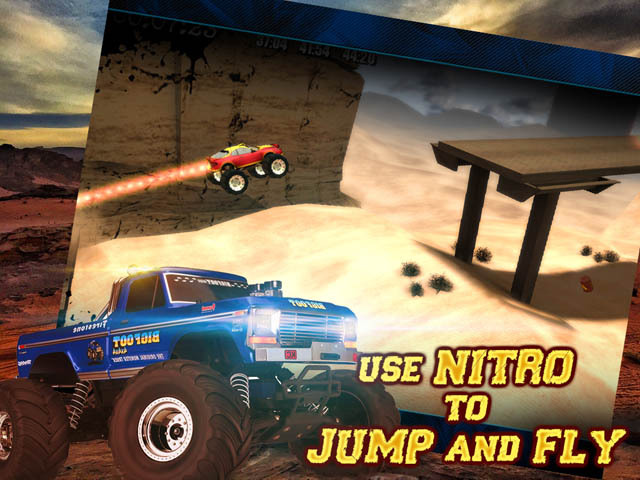 Features: 2 powerful monster trucks; 8 levels in desert land; exciting locations; 3D graphics; arcade physics; simple controls. Controls: Roll Left - Left Arrow, Roll Right - Right Arrow, Move Forward - Up Arrow, Move Backward - Down Arrow, Use Nitro - Space, Pause/Retry/Exit - Esc. Bring all the ammo you can get your hands on, because open season just arrived - big time! Deer Drive is an arcade-style 3D deer hunting game. How fast is your aim? It`s just pure shooting action, as herds of deer are driven into your sights!